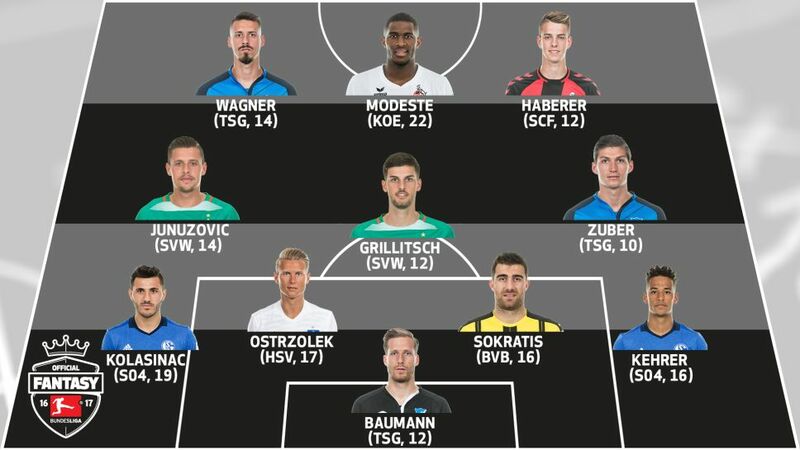 A defender whose goal broke the net and a hat-trick-scoring Frenchman are among Matchday 24’s Official Fantasy Bundesliga Team of the Week. How did your Official Fantasy Bundesliga rank on Matchday 25? Click here to find out! Baumann kept a clean sheet as Hoffenheim kept their UEFA Champions League hopes alive with a 1-0 win at home to Bayer Leverkusen. Die Werkself had no fewer than 16 attempts on goal, but simply couldn't find a way past the TSG shot-stopper. He’d played 90 minutes in Schalke’s previous four matches, so if you picked the in-form Kehrer, you were on to a winner. The 20-year-old showed no ill effects from Thursday’s match at Gladbach in the Europa League, putting in an industrious display complete with a game-leading 15 successful challenges and a clean sheet to boot. Borussia’s Greek warrior Sokratis relishes a physical battle and he stood up to all that Ingolstadt had to throw at him in Matchday 25’s opener. He made the joint-most successful challenges in his team and was key in keeping the ball out of BVB’s net. What Hamburg’s match with Frankfurt lacked in goals, it certainly made up for in commitment and endeavour, and Ostrzolek was simply outstanding. Marauding up the pitch time and again to join in attacks, he also won more challenges (20) than any other player. With Hamburg in such good form (four wins and two draws from their last eight), the former Augsburg defender is an extremely safe fantasy bet. Is he the best left-back in the Bundesliga right now? Bayern’s David Alaba might have something to say about that, but there’s little doubt that Kolasinac is irrepressible at present. Solid at the back once again, he also scored Schalke’s winner, breaking the Mainz net in the process. He was in beast mode this weekend. Give yourself a pat on the back if you picked him. Watch: Kolasinac happy to break Mainz net! Swiss midfielder Zuber delivered another outstanding display for high-flying Hoffenheim this week. His 14 successful challenges were second only to team-mate Benjamin Hübner and he provided the assist for Sandro Wagner’s winning goal. With the ball rolled across the box at pace, Grillitsch connected perfectly on his left foot and sent a brilliant curling strike into the back of the net. If that stunning exhibition of technique was impressive, well he also made 11 successful challenges. On his day, few players in the league strike a better ball than Junuzovic. After skewering in a half-volley from 25 yards, he then foxed the entire Leizpig defence to set up Grillitsch for Bremen’s second. The Austrian is a set-piece wizard and a guaranteed point-scorer. While he didn’t get on the scoresheet, Haberer banked a handy 12 points by virtue of his impressive application. An archetypal Christian Streich player, he won an incredible 20 challenges against Augsburg and was a useful foil for goalscorer Florian Niederlechner. That’s 22 points this week and 22 goals for the season for the Frenchman, who showed his complete finishing prowess to sink Hertha Berlin with a brilliant hat-trick. He’d scored two the week before against Ingolstadt, so if you picked him, you’d have been handsomely rewarded. His goal drought had to end at some point, and props to you for sticking with Wagner (if you did, that is). Hoffenheim’s battering ram scored the winner against Leverkusen on Saturday to end a run of 458 minutes without a goal, netting the club’s 250th home Bundesliga goal in the process. Click here for the Matchday 25 round-up!